I have been thinking of ways of structuring this post to make it easier to read and more comprehensive and the only thing that seems to make sense is to go by brand. We tend to be loyal to companies whose products we like, so if you were to walk into our house, you’d see lots of items by the same brands. It doesn’t mean we are not open to other companies and makers. In fact, on the contrary, I am always looking for new ideas and products, but usually when you happen on a product that really really works, you end up sticking with it, at least until something else comes along. So it’s even more relevant when it comes to toys. I have favorites, companies that I know I can trust from the safety standpoint and those that make beautiful, functional and fun toys. 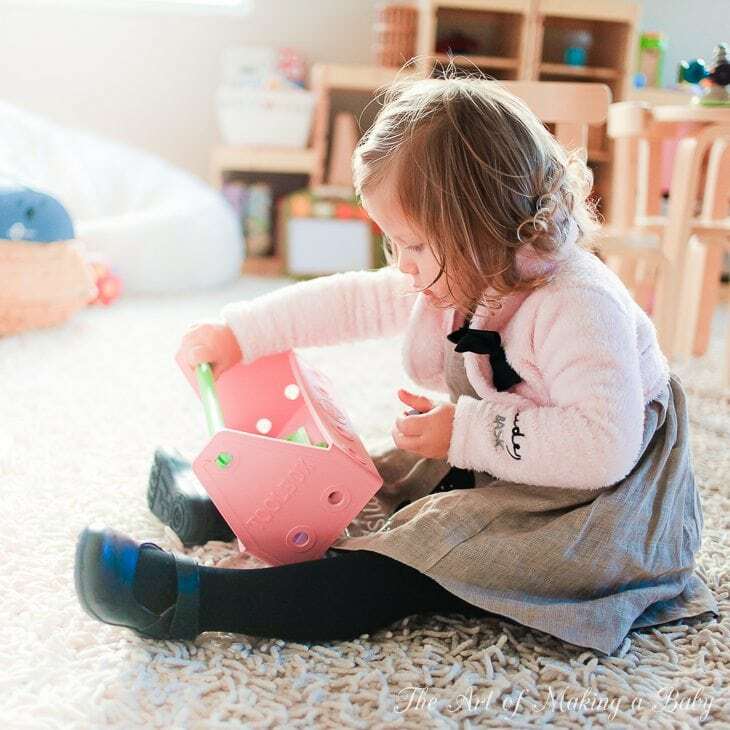 A while ago I wrote about toy safety from the toxin standpoint and outlined some of the companies that make better toys with fewer recalls, some that claim they are lead free, BFR free and approach safety consciously. 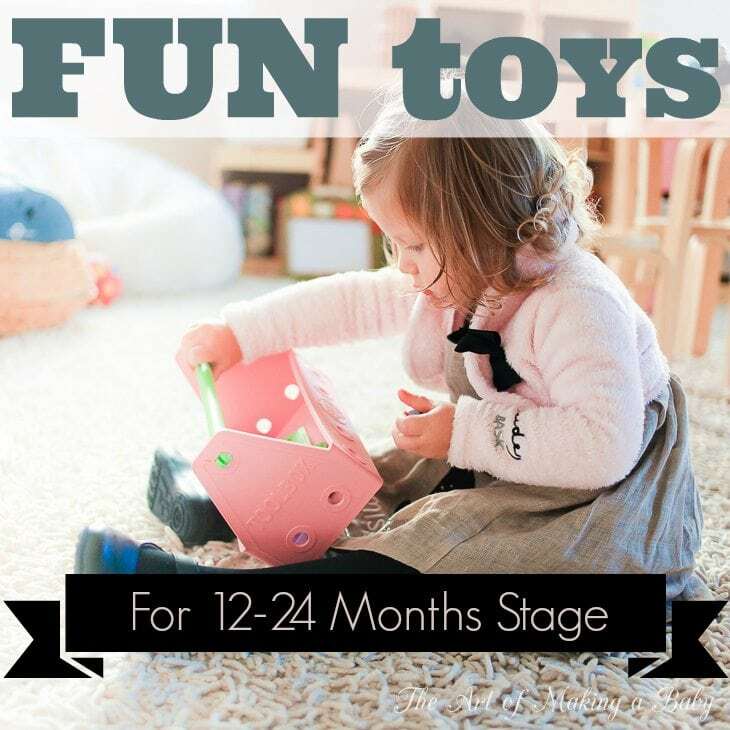 If you’re just starting on my blog, make sure to check that post and then go over the toys that we found useful for the 0-12 months stage. Also don’t miss the post on Tag Toys which are the most unique toys I’ve ever come across. For now, in case you are looking to replenish your playroom, buy birthday gifts, or are just curious about which toys Lexi plays with on daily basis, or used to play when she was slightly younger, read on! This has been a favorite from the beginning if you can remember, a really great company with a green approach and amazing toys that foster imagination. All toys are made in Thailand from All Natural Organic Recycled Rubber Wood. We have two mommy and daughter snakes. They aren’t sold that way or anything, but it so happens that Lexi absolutely ADORES having two so that she can share one with me. Right now we’re in the “LEXI TOO!” stage and everything needs to be done together. So she pulls out both snakes, gives one to me (MAMA!) and takes one herself (LEXI!). 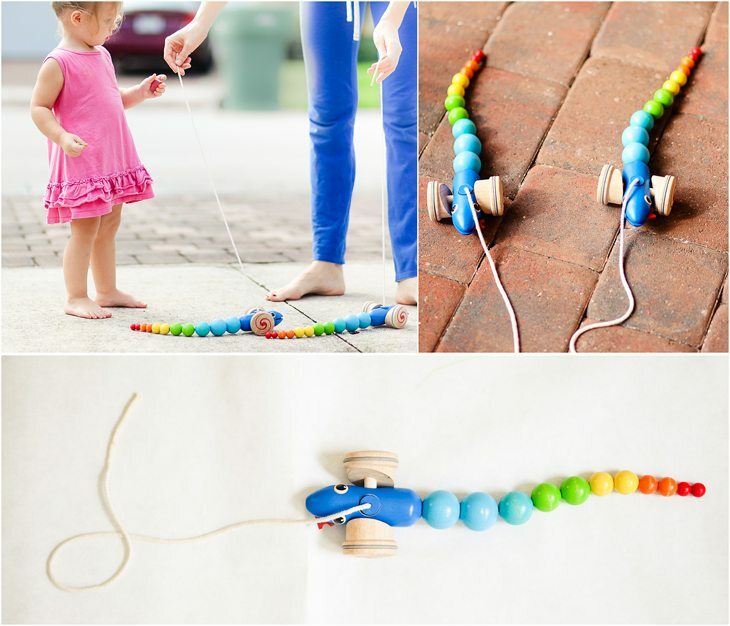 The snakes wiggle and move their bodies as you pull them which makes it a bit more fun than a simple pull toy. I think pull toys, in general, have a limited life with the toddlers, depending on their temperament, so at the age 22 months, she’s moved on from the pull toys as they don’t offer a lot of active entertainment for her, but if you have a baby who’s a PULLER (you’ll know what I mean if you do), then know that we really loved this toy when it was developmentally appropriate. 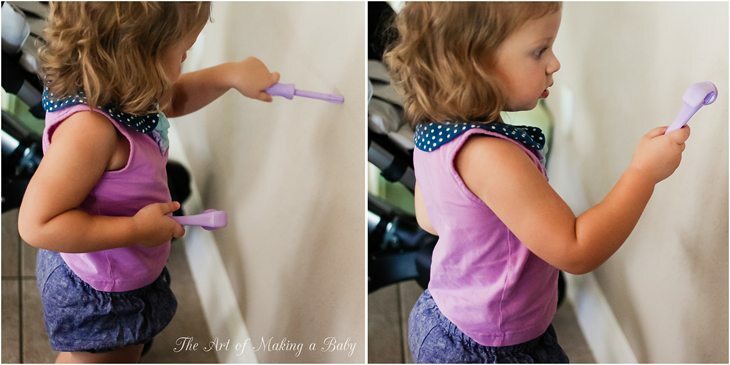 APPEAL: 1Y+ DEVELOPMENT: fine motor skills, role-play. Again it’s made of the same rubberwood that feels heavy and substantial and is a pleasant toy to handle- the quality is very apparent. We have many other Plan Toys products at home but these three are the ones that get used the most. She’s almost grown out of toys like this at this point, so some time next year I am looking to get more of the pretend play toys from Plan Toys like their fruit and vegetable sets. 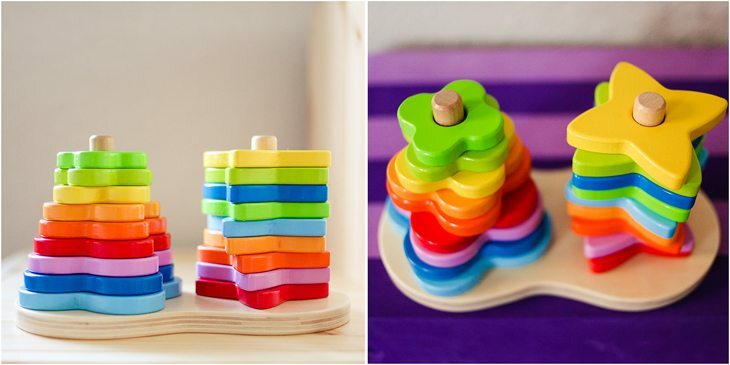 Another company that uses only wood, though different type of wood than Plan Toys, and has a great assortment of toys. 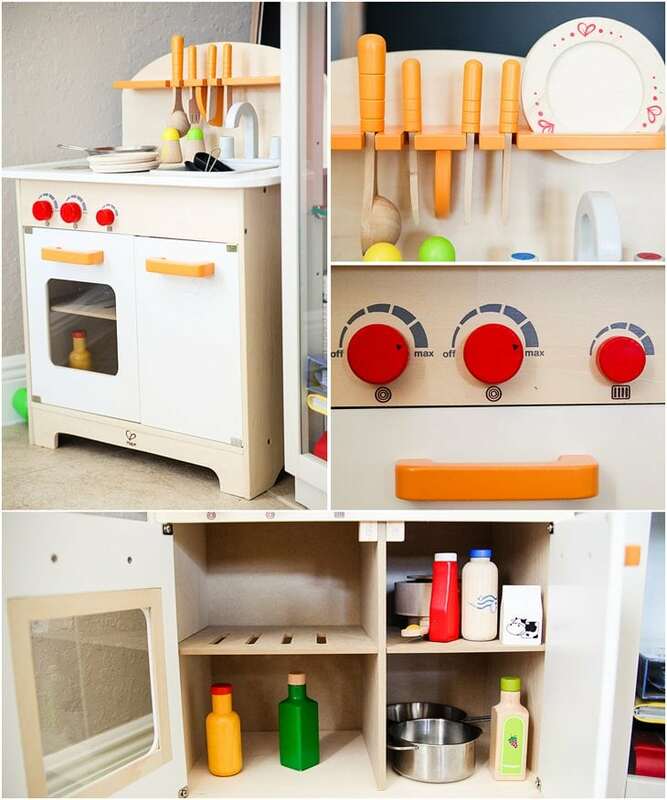 We started our Hape collection with the kitchen and have since bought countless products. Their selection is truly unbeatable. Soon after she fell in love with the kitchen, I had an idea to buy her a cappuccino maker (technically it’s a coffee maker, but we don’t drink coffee). She loves making real decaf cappuccino with daddy and goes through the whole process as that’s something they have been doing since she was 12 months old. So this was a great way of imitating what we do. A no-brainer for boys and a fun toy for girls! This is an awesome toy for two kids or more since they can play off of each other. When buying toys, I don’t really differentiate between traditionally boy type of toys ad girl type of toys because she plays with both equally, so I just go for what I think she would like. Lexi is a a very girly girl, but she also likes cars and trucks and planes. This racetrack is like a ball tracker seen in other brands but with a car racer theme. You get 4 cars that, when placed on the track, take off on their own, going from side to side and then finish off at the bottom. She was still tiny (12 months) when we received this toy and I had doubts as to whether she’d even get the concept, however she instantly caught onto it and started playing with it. Pounding? Not so interested. Xylophone? Obsessed! This xylophone was one of her first true musical instrument obsessions ( and if you follow us on IG, you know that the love for music and instruments has been in FULL since about 16 months ). She would literally carry it everywhere and make us look for it and the hammer if it was missing at all. The concept of the toy is you pound on the balls at the top of the bench and they fall onto the xylophone rolling down and making a pretty sound. 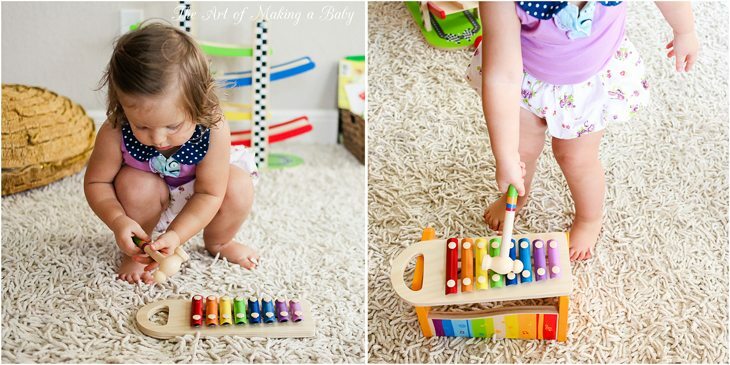 The xylophone can be pulled out and used as a separate toy. It’s really perfect for boys who like to pound on things as it doubles as a xylophone and makes music giving them exposure to something boys something don’t pick up on their own: music. This my favorite stacker from the aesthetic standpoint. I love the colors and the shapes. 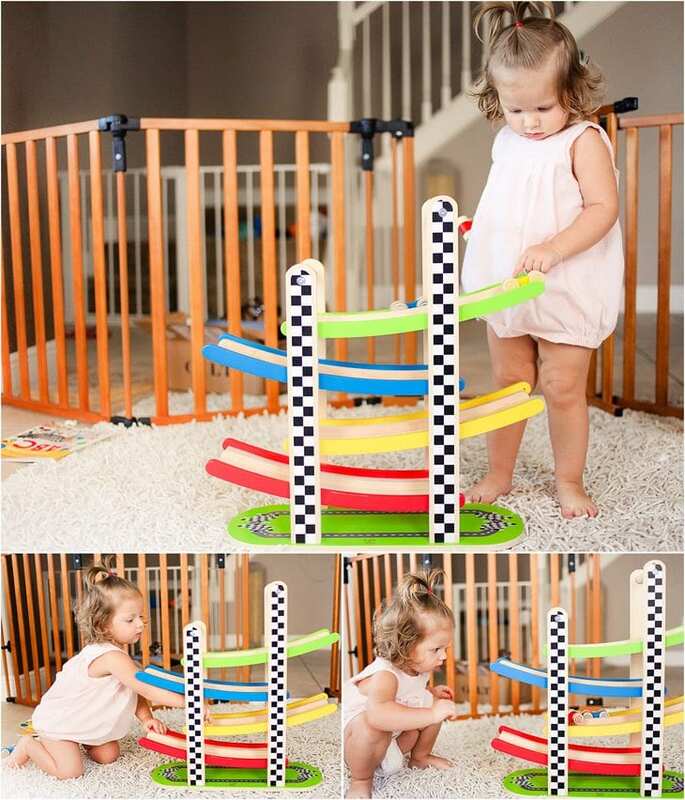 As a toy it has several uses: color sorter, shape sorter, size sorter and the process of threading something through that Lexi enjoys so much. Right now she is NOT into any type of sorting by color or size or shape, she doesn’t have the patience for it ( so like her mama), but I just see the toy getting a ton of use as she changes her interests. Hape Alphabet Abacus has been an invaluable alphabet teaching tool (along with some iPhone apps), her first words and letters came from this toy. She rarely uses it anymore since she has pretty much mastered the alphabet, but this has served us well. Eggspressions– LOVE! What a great concept- egg faces that teach emotions. She loves it and often tries to find the sad and the mad guy and “make them feel better”. She is actually fascinated with those two emotions. She always looks so puzzled when someone around her is sad/crying and makes the same puzzled sad face when she finds her sad egg. These little buddies are one of the main reason she understands those emotions and we have been playing with them to for a while. 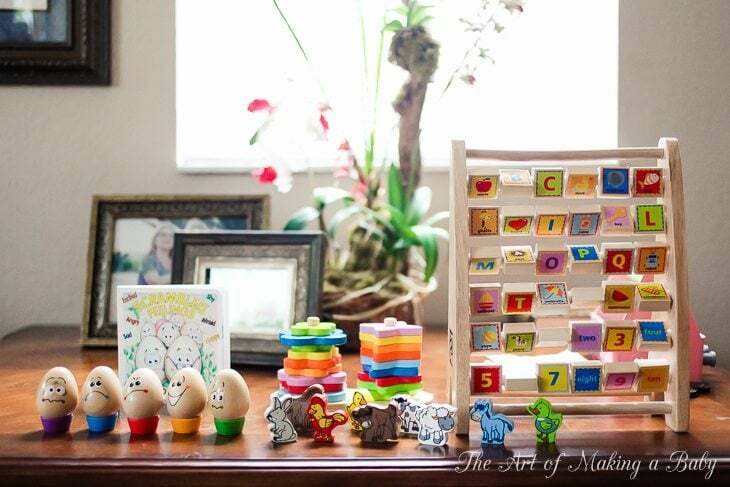 Qube Animals– really cute tiny animals ( non-chokable) that are perfect for little hands and sorting or putting in boxes and pretend play. They are also great to take with you on your travels since they are small. Again, we’ve been using them non-stop. You’ve seen these around on my IG and random photos, as well but I’ve never actually written about them. Boblesis made by a Dutch company and is a super creative and fun play furniture for small and big kids. It’s made of EVA foam that has been tested for formamaide, so it’s completely safe. 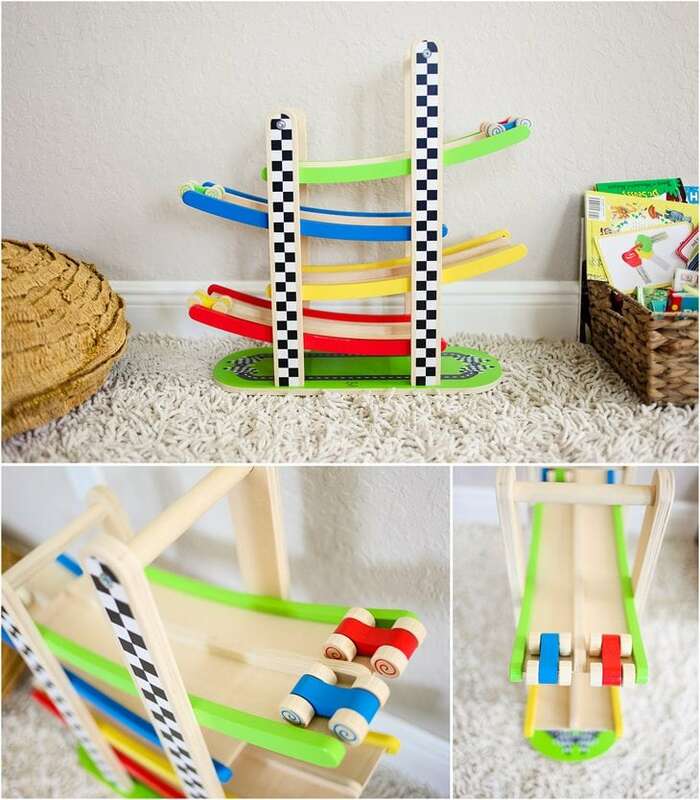 It’s truly such a universal toy because it can be used in a variety of ways: you can create obstacle courses, use it as table and chairs, practice your balancing skills on it- sky is the limit. The pieces are all so different from each other that I can’t even decide on our favorites. The croco, elephant and AntEater are all pretty versatile and cool. This is the kind of play furniture that will last through the years. 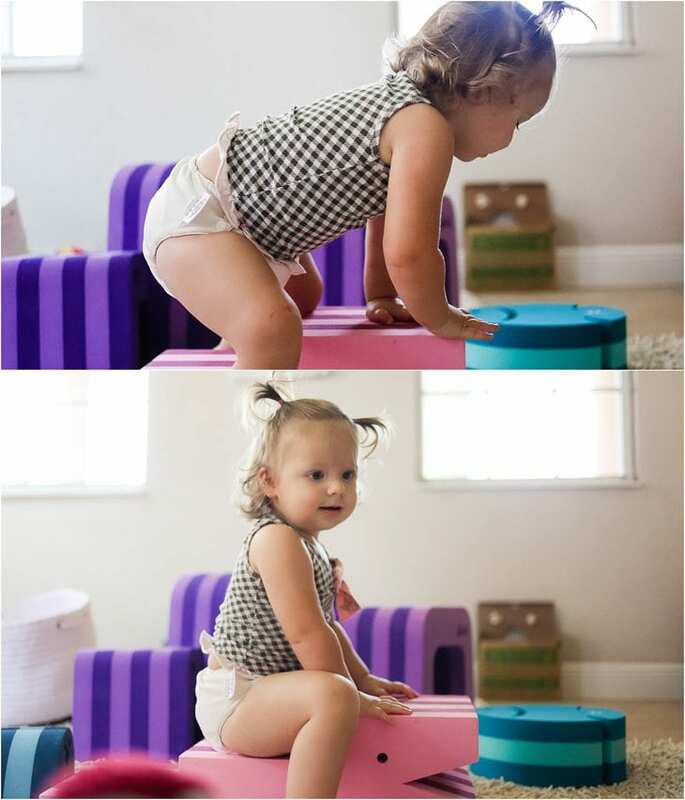 4 year olds that visited out house have loved it, older kids will find ways of testing their balance limits on and of course toddlers and crawlers love exploring it, too. Green Toys are truly amazing! I find myself buying more and more toys from Green Toys. Besides making boy toys in girl colors, and girl toys in boy colors, their toys are just so unique in a way, yet simple and “common sense”. All toys are made in the USA from recycled plastic milk jugs, no BPA, no phthalates. This was our first Green Toys love. 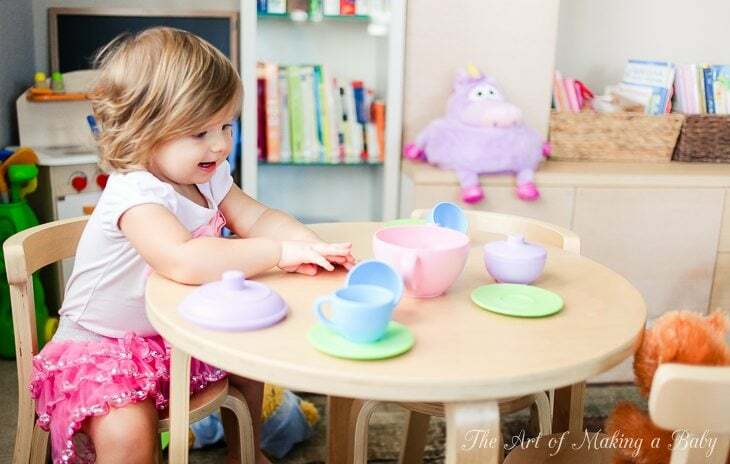 The concept of a tea party immediately sunk in and became one of her favorite (and first) pretend play games. Again, I adore the style and the soft colors of the set, just like any other toy from this company. 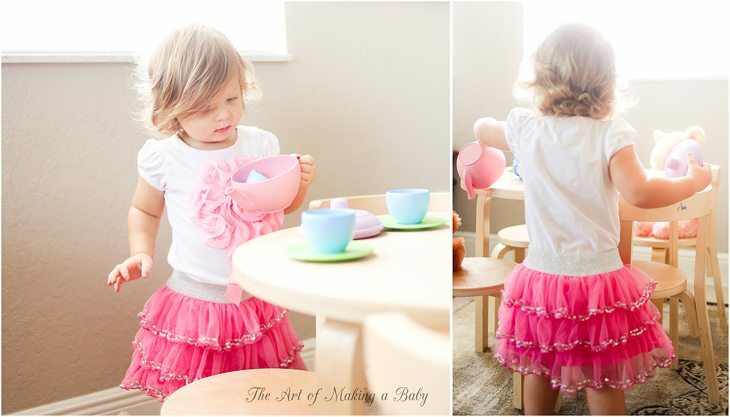 From the youngest age she would run around pretending to pour tea into a cup and then “drinking” from it. By now it has developed into full blown pretend play with cooking, and pouring milk and stuffed toys (or daddy, whichever is closer). It does come with small spoons that I removed immediately since she kept them in her mouth while running around and probably won’t bring them back until the concept of “Don’t run with sticks in your mouth” gets through. 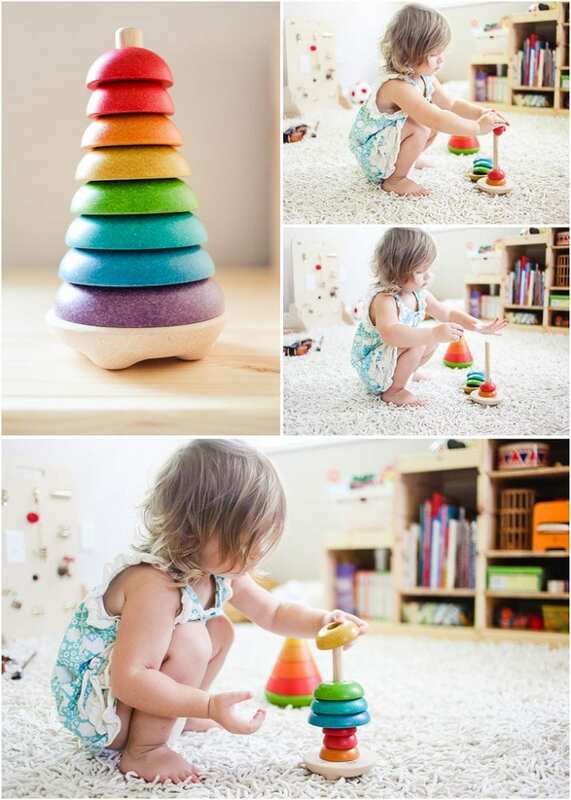 This is the only traditional shape sorter we’ve ever had and it is brilliant in its simplicity. 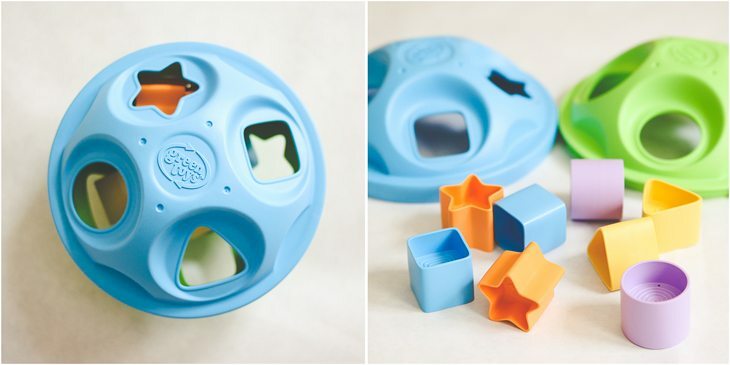 The shapes are really easy to grab even for the smallest babies who don’t have the greatest coordination, it opens easily to remove the shapes and it has huge aesthetic appeal to me. She still plays with it all the time and can now open it on her own. We have two sets- one of upstairs and one for downstairs, that’s how much she loves it. 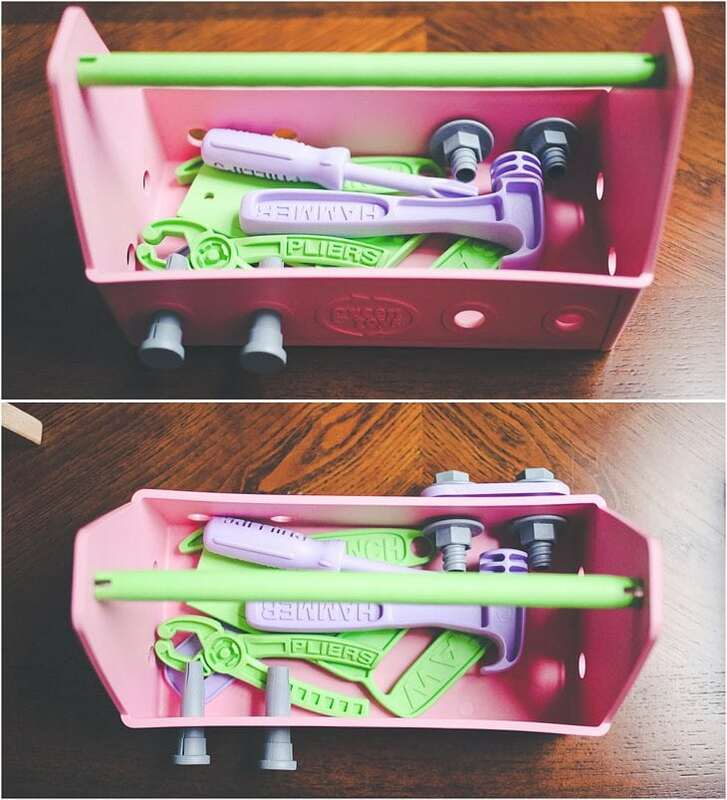 This toolbox (comes in different colors) has fully “workable” screwdrivers, pliers, hammer, saw, bolts and holes , so the toy is self-contained . It’s the type of toy that keeps toddlers engaged for a while and lets them role play and pretend to be just like mommy and daddy. 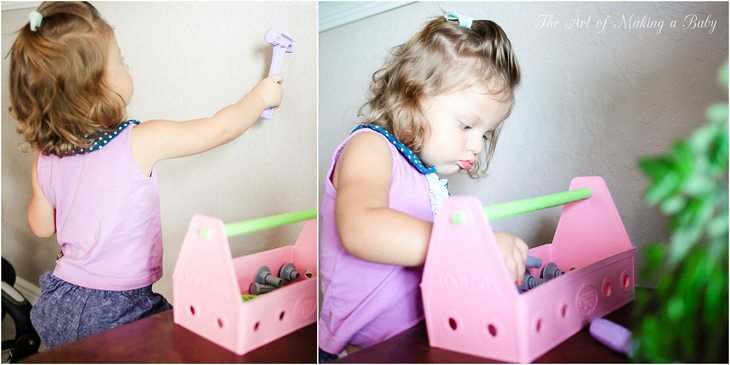 Lexi loves to regularly grab a screwdriver or a hammer from her box and run to the wall pretending to fix it. Build-A-Bouquet – she uses these in her sand table and plants flower gardens. I’m planning on buying a truck, since she is obsessed with them and a few bath toys too, like a seaplane and a submarine. 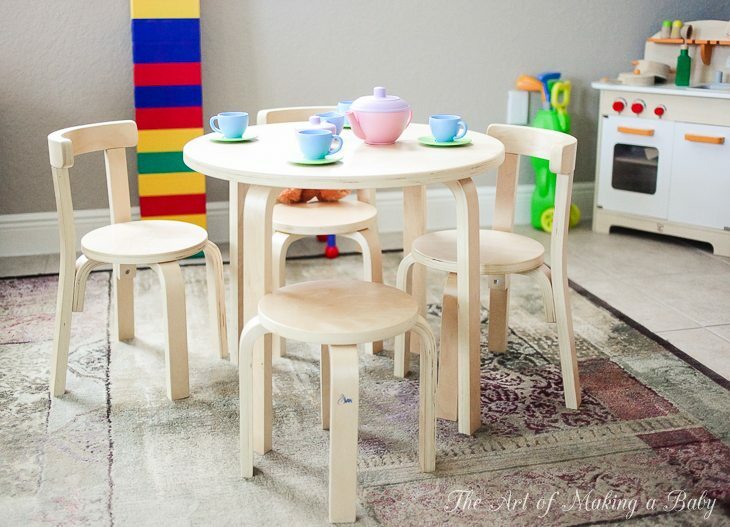 Oh I love this Play With Me table set. Aside from the beautiful natural finish ( it also comes in other colors), it’s so classy and realistic, as well as high quality. SOLID WOOD, baby, no particle board! We’ve been using it since before her birthday. It was the key piece at her birthday party as you can see in this video below. I love that they thought of everything when designing this kid’s table: rounded corners (because kids can be so clumsy), so Lexi has never had an accident where she got hurt using it (which I can see being an issue with a square table). I absolutely adore the fact that they thought enough to include one chair for adults. 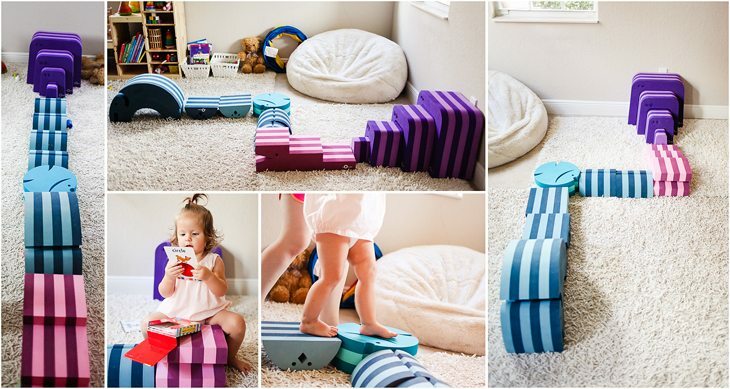 Most kids enjoy playing with their parents rather than alone, so this has been really helpful since sitting on a kid size chair is almost impossible. The “adult” chair is exactly the same but without the back so you can distribute your weight evenly and not balance on the edge. This is a fun toy for every age. 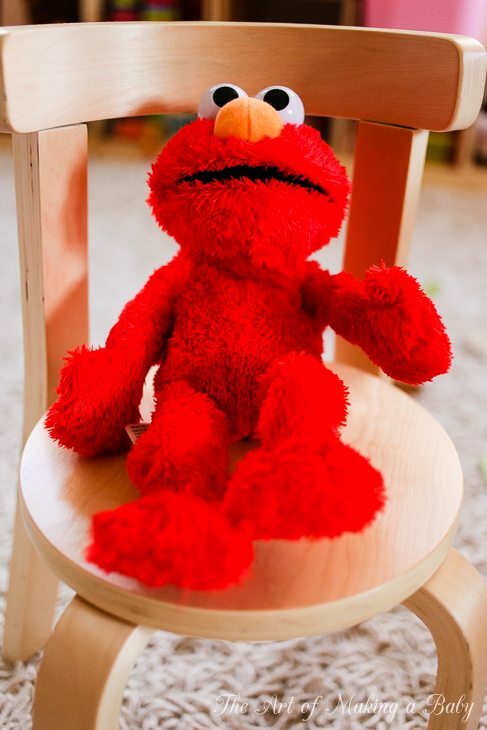 An Elmo character that laughs when you tickle him and make funny noises and then asks you to do it again. It’s always adorable to watch how kids respond to him and pretend to tickle him and laugh at the same time. Lexi has not really watched Sesame Street, but she knows who Elmo is and always points him out everywhere. Recently we were given a Cookie Monster as a gift, with the same concept of interactive play where you put cookies in his mouth and he “eats” them and sings songs, as well as counts the cookies. Then you get to retrieve them from his backpack ( which is one of the best parts of the toy). Lexi adores the monster and sits there giving me him cookies over and over and over again. The first time she played with it, she sat in her car seat for 30 minutes on the way home playing with it non stop. B kids tablet is a simplified version of a tablet perfect for the beginning stages of interest in such devices starting from about 6 months. 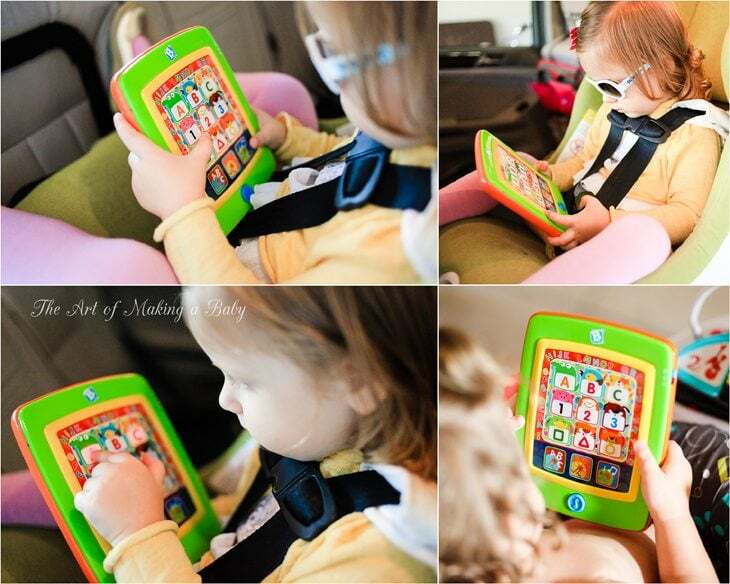 As your baby gets closer to 18 months, she might or might not be more interested in the real version, but if you have kept all iPhones and iPads away from her, this will at least make her feel like she is playing with her own version of an adult toy. Even though Lexi has always had access to the media devices (if somewhat limited), this has presented enough interest to keep her occupied in the car when she is in the right mood. It plays ABCs, 123s and animal sounds depending on the setting, as well as some limited games. The ABC Touch Pad is probably best to be started from 6 months on, however since I never mentioned it in previous toy posts, I thought it was fun enough to include it here. She still plays with it from time to time and can figure out the settings and how to switch from games to abcs, so it does have some limited interest potential even for the older crowd. There are some other toys that I would love to include here but I am adding them into other upcoming posts about musical toys and toys for physical development that we’ve been loving, so I wouldn’t want to repeat myself. Very nice review! There are a lot of toys you mentioned that I’ve been considering buying for my daughter. Ha! Honestly? I have no clue. Rereading it now- it makes no sense and I’m not sure what I was trying to say by that. I wrote it a while ago and it must have been late night. My daughter looooves trucks especially dump trucks so I don’t really limit toys or interests by gender. I think I was trying to say that in general, boys like to pound on things more than girls. But of course it’s not exclusive. The second part is just nonsense. Haha. I should change that sentence when I get a chance. That makes sense. Thanks for the reply! It’s two toys for the price of one! The bed of the truck tips, just like the dump truck you linked. But the race car sits in little grooves on the flatbed. DS (a month younger than Lexi) has had it since his 1st birthday and plays with it every day. He puts the race car on top, tilts the flatbed, and the race car rolls off. He also plays with the race car by itself. He also has the seaplane which is great in the pool (or ocean in your case, no ocean here!). Oh thanks for that! I think I saw what you’re talking about. And def. looked at the seaplane before. We have a normal plane that we used for our first flight. Cute Toys!!! Is she not into baby dolls? My daughter was obsessed with them at that age! She also got a LOT of use of her baby stroller. She used to nurse her little babies. So cute. My favorite doll is a corolle doll that smells oh-so yummy! Also, keep an eye out for Magna-Tiles, she’ll soon be old enough for those and they are soooo much fun for parents, too! I am obsessed! She really ISN’T! Plus I haven’t been able to find one not made of PVC. Corolle is non pthalates PVC but I’m still iffy though the dolls are soooo cute. hmmmm… I wonder about cloth dolls, then? I’ve seen cloth dolls on land of nod before, but never looked at them closely. I’m the same way–I don’t buy toys based on gender for Gia. I buy (or ask for as gift) what I know she’d like. She is not into dolls at all, but loves cars and trains. yes, the kitchen is amazing! She plays with it regularly. She keeps coming back to it more than any other toys especially recently as she is oly now starting to play on her own without my involvement. But you know every kid is differnt, so I have no idea how your babies will do with that. 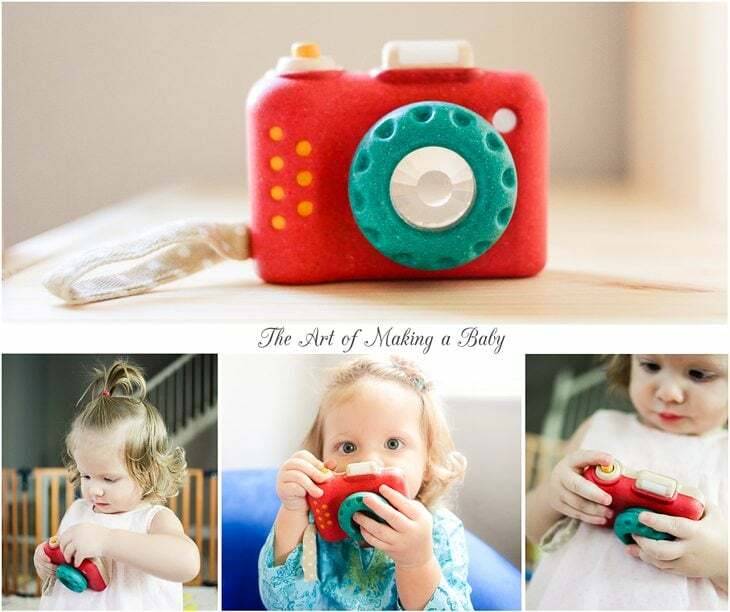 I think it’s an awesome pretend play toy! I do rotate toys, but as soon as take away certain ones, she goes and finds them in a drawer and starts playing with them. lol The kitchen I linked to is only $100 and is definitely worth it, in my opinion. I want to get a fridge now. Classes and their benefits that I can see in Lexi – great post idea. Awesome post! I actually was kind of relieved to hear Lexi doesn’t play with dolls much either. My daughter (18 mo.) 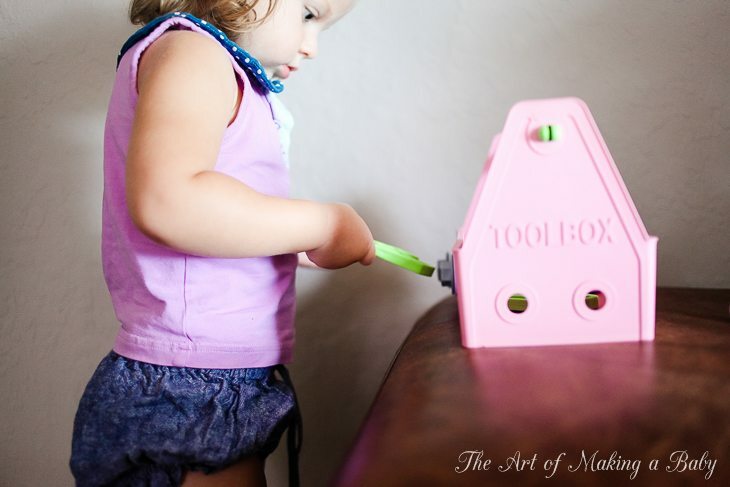 Is so much more into musical toys like the xylophone toy and mimicing mommy in the kitchen with toy mixing bowls and pans. Are there other music/instrument prep. Tpys you have found that both you and Lexi like? Selfie magic- not sure why it didn’t let you comment. I might have them turned off for now, but thank you for supporting me there! Do you have any other recommendations for “green” table and chair set? I love the Svan one but its a bit out of our price range. I was going to purchase a P’kolino set when I read a review about formaldehyde in the glue!! All others I’ve seen are even more expensive! What about trying to get one used? On CL or eBay or even amazon? Thank you I will look. Quick random question but what is the name of the song you used in your YouTube video Jumping in the pool at Marriott Singer Island, 15 months old? My daughter loves it!! Cute video! We also mostly only use plan and hape toys. We have almost all of green toys, love the pink truck and race car. I don’t usually like the pink stuff but I thought the race car and truck were 2 cute toys for a little girl. We also have the beach toys and love them. I don’t give my daughter musical toys but we do have a couple that were gifted. I keep those in the car. She goes to a montessori preschool, so she is not overstimulated at school either. She gets to watch one show per day and she chooses Daniel tiger or peppa pig. Some days she’s asks me to watch house hunters or property brothers lol…can u tell I watch it a lot? We try to keep the tv off when she’s around mostly though. Nice article. After reading this article I completely agree that children love different types of toys. We just have to select proper toys according to their age. I have 2 year old daughter. 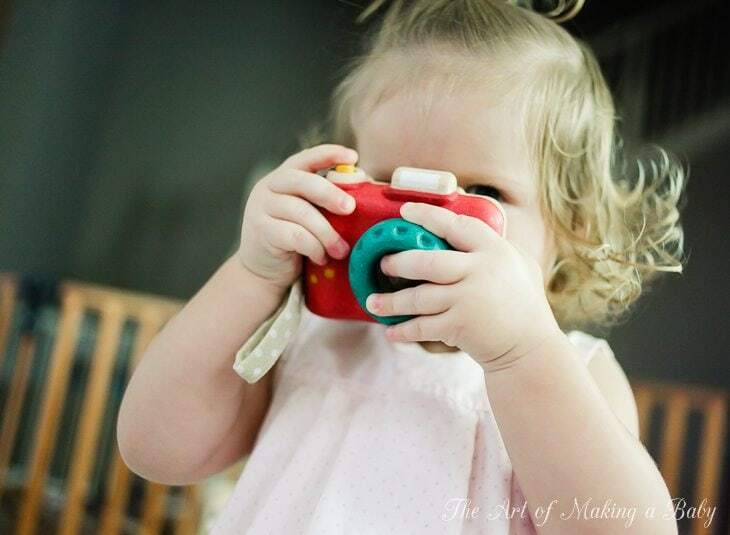 Recently I ordered non toxic art products from http://www.pureandsimplebaby.com. Could you please tell me the brand of the storage cubes you have in Lexi’s playroom? I see a blurry version of it in lexi’s stacker toys picture. It’s looks like its natural solid wood and I have been looking for one! Thank you!